Diamond Queen is a brand new online slot from IGT Gaming and it’s a back-to-basics kind of game with some nice graphics, simple gameplay and the ability to keep you wanting to play. The game dispenses with too many elaborate features but keeps just enough to make an entertaining slot. 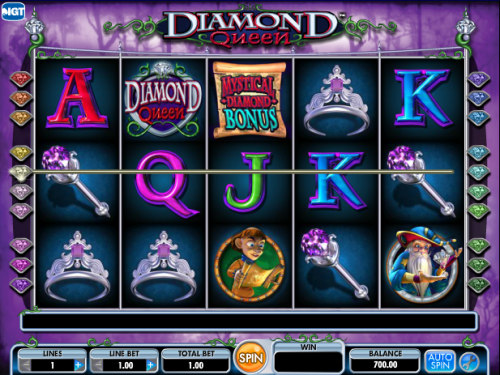 There’s a real fairytale feel to the slot with the beautiful Diamond Queen herself as the main character. IGT uses some basic playing cards as it’s low value symbols but higher up the scale we have a tiara, a sceptre, a page boy a wizard and the Diamond Queen logo. The queen herself is the wild symbol and there’s also some Mystical Diamond Bonuses which appear on reels two, three and four. Spin three – reels two, three and four are completely wild. So as you can see, by the time you get to your third free spin, the three centre reels are all wild, massively increasing your chances of a decent win. This is a minor bonus which is activated in standard gameplay and uses the Extra Spin symbol which we haven’t mentioned yet. If you are lucky enough to land it on the first reel you’ll get another spin entirely free. 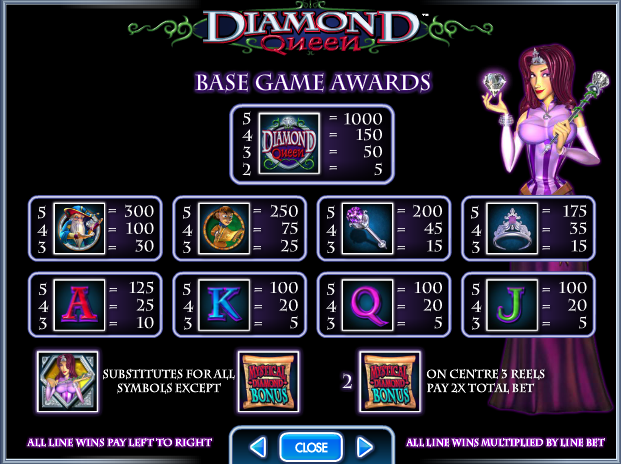 Diamond Queen might not feature too many bells and whistles but that’s absolutely fine by us; not every slot needs a huge variety of bonus games. The symbols animate nicely when they create winning paylines and this is a game you’ll keep coming back to. You can bet on 1, 3, 5, 9, 15 or 20 lines meaning the minimum bet is £1.00 while the maximum bet is £600.